Sometimes this time of year sneaks up on me by surprise and sometimes I ride it out like a long gentle slope of fresh powdery snow. This year it’s both. Here we are already to the end of February. A full trip around the sun we have come since a dear friend and auntie left this world and our first born is soon to turn 3. I see Aunt Jen’s light in Ava’s young eyes. A new and wondrous season is upon us, but we are first faced with a very cold and chilling end to winter. The next several days promise frozen puddles and inches of snow while today the crocus flowers smile into the sunshine. We are truly praying that this years spring will be different than last and that summer will come on schedule rather than last year, the year that summer never came. Our climate is the border edge of the puzzle and we do our best to match the pieces together and farm with some coherent picture in mind. It’s our movie….our picture. While this is challenging and difficult at times it is also what attracts my husband and I to farming. When it all comes together what a joy it can be! We continue to be extremely grateful for the oppurtunity to be involved in living systems and to be custodians of life. That is the little and the big of it, the micro and macrocosms. Each winter into spring we are building and starting a new community of plant life and life in our soils. We will nurture it and tend to it with care until it brings us life in turn by building a community of farm friends and neighbors who wish to partake in the bounty. The sunshine sparkling prisms on the tall rain drenched grasses, the pair of Anna hummingbirds that wintered with us buzzing by and the deep resonance of my bass chimes in the beguiling winds all cause me to pause and sigh…and smile. Yep. This is what we do. We have started some native ‘insectory’ plantings, working in conjunction with the NRCS or National Resources Conservation Service, a branch of the USDA. The aim is to create zones of year-round blooms or fruit on native plants which, will in turn attract various beneficial insects and animal communities. This is right up our alley and actually something we maintain as integral on the farm already. Organic farming works best when buffer zones of trees, shrubbery and wildlife are left alone to thrive and increase diversity of living things. The insectories will serve as refueling stations for the insects in various stages of life and in turn hopefully increase the numbers of beneficial ones coming into our fields. It’s a win-win for us, our crops and also the research which aims to decrease if not discontinue pesticide use altogether. We are almost done with the bare-root plantings and look forward to watching over them with care and vigilance over the next few years. We have been busy in the greenhouse as well. Most all of the first runs of seeds have been sown. Certainly all of the spring and extended season crops are up and even some of the warm weather summer crops. We will grow them on in our greenhouse over the next couple months. They’re cozy inside until we can work some ground or it’s safe enough temperature wise to plant them out. We have some new crops we are trying for the first time this year like artichokes and some cool cabbages. We finally have enough space to plant out artichokes, and we aim to have enough for everyone in the CSA. We are anxiously watching the buds of our young fruit trees and shrubs, hoping they won’t be in such a hurry to break dormancy and then risk getting nipped by an arctic freeze. I for one am greatly looking forward to their coming of age gracefully. I have also been busy making soap. Pleased to finally have a list of bars (recipes) that I am confident enough with now I am stocking them up, regularly making small batches. I really enjoy the calming meditative process of stirring the soap and the thrill with anticipation that comes from not knowing exactly how each different batch will turn out. It’s a side hobby, but I’d love to sell you folks some. My values and principles in soap making are the same as they are in our farming. I use the best oils and butters I have found and make bar soap the hand-made, old fashioned, ‘cold-process’ way. I have a nice inventory of oils, many organic, and an extensive collection of herbs, essential oils and fragrances. I don’t use any chemical additives, colorings or preservatives. Anytime I include milk or cream it is raw milk from my aunts’ goats, and the raw honey I use is that of the Gales Creek family Wessels. I like to use as little as possible to get a good bar of soap. Oh and the soap works. Bonus! It lasts like nice hand-made soap, cleans the dirt off and doesn’t leave your skin dry and itchy. I’ll have more info on Love Farm Soap up on our website soon. I think I’ve rattled on long enough now. I’m not quick to blog write or program on our website, but am getting there. I am welcoming in the new season with body, mind and spirit. We are truly looking forward to a wonderful year of the freshest, hearty and nutritious, delicious foods we can grow and bring to you. Until the next time, we hope you’re eating well. Enjoy the snow. Well here we are. While we are refreshingly taking a breath after ending our 2010 season, we have had many folks anxious to get enrolled in our 2011 season! This is indeed fabulous news! It seems our formative farming days of slower early winters are over. My father has always told me that there are tons of farm things to do in the winter, but we are now finally understanding the scope of this. The true realization is that even though you don’t tend to the harvest much physically in the winter, so much of the actual farming foundation work is cared for when the soil can’t be. So with that we order seed and plan our plantings. I intend to have our ‘Join Us’ form updated and running by the end of this week when I will send out a group email hopefully inspiring your interests for the farm bounty once again. Best wishes for farm, fresh, organic foods over these frosty months. Hope you are having fun preparing for, or relishing in your holidays. What a wonderful November day to remember to count all our blessings ~ The sun was peaking through a cloudy sky and we had snow on the ground! Every day is a great day to appreciate and be grateful for something, however today is the one day most people in our part of the world make a conscious effort to. Every day I am grateful for my life…. as a farmer, a daughter, a wife and a mother… but I cherish my blessings so joyfully today. The little ones cheeks are rosy and today their faces glow with smiles ~ their eyes see fun love and wonder. My heart is happy. I’m hoping everyone had a wonderful Thanksgiving and can feel this peace, the peace of a life loved. This Weeks Vegetables: Braising Mix, Potatoes or Beets, Cabbage or Brussels Sprouts, Broccoli or Turnips, Radish bunch, Celery bunch, Tomatoes, Garlic, Winter Squash and a Pepper Medley mix. Braising Mix: The fresh harvest bag of greens this week will be a healthy mix of Asian and mustard greens. We are hoping to mix in plenty of chard or kale to help offset the super strong flavors of the mustard greens. Sautee or steam these greens and then add strong, sweet complementing flavors like goat cheese, apricots or cran-raisins or candied nuts. Potatoes or Beets: Both have been very tasty the last couple weeks. The potatoes are wonderful baked, mashed or fried. If you keep them in a cool, dark and most importantly dry place they will last for months. The beets have great looking and tasting chard greens on them so don’t forget to add those to your braised greens mix this week while cooking your meals. Cabbage or Brussels Sprouts: The remaining cabbages are being gathered from the fields after a huge run of months it seems. The stalks of brussels sprouts that were left behind last week are getting cut this week as well. You should get your choice of tiny little cabbage balls or one big, healthy head. Broccoli or Turnips: Yep, we are still cutting broccoli in the fields. Some pretty beautiful large heads even! 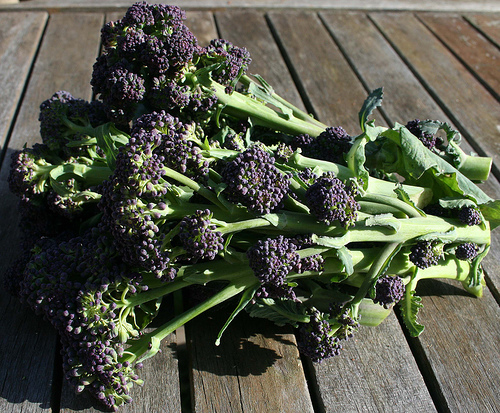 We really have been enjoying the purple sprouting broccoli. It’s tiny heads on several longer stalks all bunched together make it most interesting and the flavor is better than regular broccoli to me. You should have a choice this last week of some broccoli or a nice bunch of small, tender, flavorful turnips. Radish bunch: Fun bunches of various radish add a nice spicy element to the share this week. We bring you some round, some long, some fat, some skinny….whatever you get, we hope you enjoy the fresh fall radish. I know some look like purple and red carrots, but nope~ they are radish. Celery bunch: For the last week we bring you more of our farm fresh celery. The celery with flavor! The dark green and redish stalks are great fresh or chopped up and added to soups and stir-fries. We love the greens too, and use them like parsley. Tomatoes: Still some yummy, heirloom varieties remain and some tough skinned varieties. They are both meaty and flavorful, but some may need some counter-top time before they come to optimal ripened flavors. I am already discouraged by thoughts of tomatolessness. I made another big pot of marinara sauce over the weekend and am going to post my ‘eggs-in-sauce’ tutorial this evening if you are interested. Garlic: More delicious garlic for you to hoard for winter. Winter Squash: Another year of low winter squash turn-out. At least those of you who were here for the bumper crops we’ve had in the past, know that we can grow them. Some strange effects of low summer heat seemed to cause this years plantings to yield weak amounts. Enough of that….you have them this week anyway! We have many different kinds but in low numbers. Some of you will have acorns, butternut types, kuri, koboucha, dumpling, delicata, sweet meat and/or culinary pumpkins. They should last for weeks and often taste better with age, just don’t let them freeze. Next year we will hope to bring you more. Pepper Medley: We’ll round out your final share of the season with the last of our farm peppers. You all should get a variety to choose from, some hot and some mild. Peppers are a great addition to salads, sandwiches and sauces. They can’t be beat stuffed with cheeses either! FARM NEWS: So here ends our 2010 CSA shareholder season. We’ve had a great time this year and continue to learn so much about farming and feeding folks. From what we’ve heard from many of you this season has been better than satisfactory and in fact more than you anticipated in taste, variety and quantity. Hooray! Farmer Kip and I feel that we farm better each year and continue to learn greatly from your input positive and negative. We honor your suggestions and feedback on every facet of what we do. We anticipate a new drop-off location for our Wednesday’s next season possibly closer to Hillsboro, and perhaps a second location in the Beaverton area. We are happily looking into designs for t-shirts and market totes this winter. We think it’s probably time for that. Also there is much work to be done on the web-site and the blog this off season so stay tuned. I’ll be updating on facebook as well. I do update the blog over the winter so check in periodically to see what’s new on your farm. Thanks for your support and another wonderfully fresh year!! We can’t do this without you and we’re so grateful to have you in our lives. 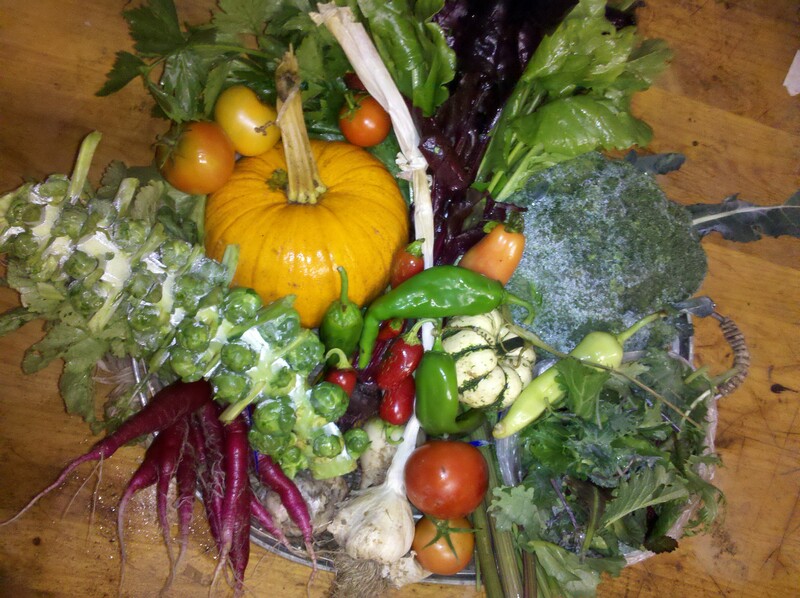 Here’s to eating farm fresh and local over the winter……maybe in the not to distant future we can help you with that. An early Happy Holidays…peace and good will to all! 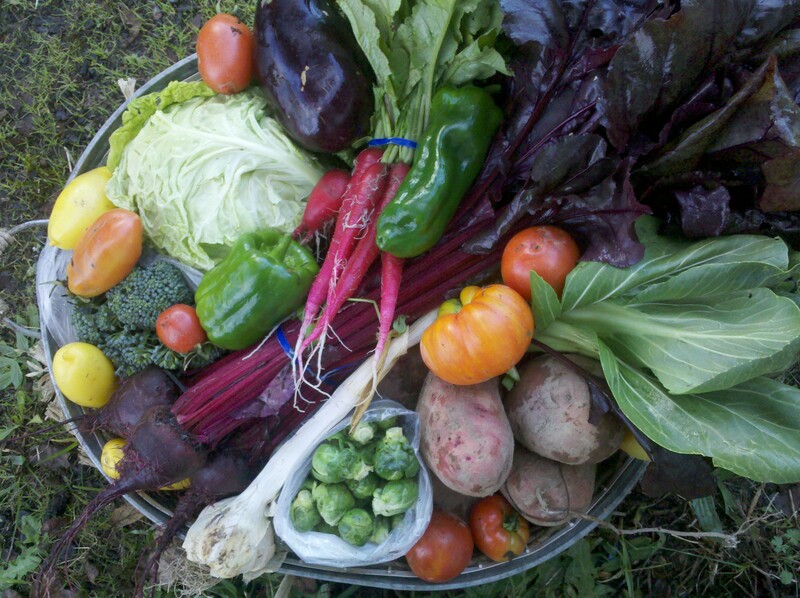 This Weeks Share: Bok Choy, Bulls Blood Beets with great quality Chard greens, a Brassica (Cabbage or Broccoli), Radish bunch, Tomatoes, Brussel Sprouts, Garlic, Potatoes and a bonus Summer Item of Farmer’s Choice. Bok Choy: This crop of lovely vegetable has come to it’s peak. Heads are the perfect size for tender eating and sweet, crisp flavor. This time of year the flavor is more subtle and less sharp. Its white stalks resemble celery without the stringiness, while the green, smooth leaves resemble a lettuce. This light green-leaved variety is prized for it’s delicate flavor. The Chinese commonly refer to bok choy as pak choi or “white vegetable.” Bok choy is great in stir fries or soups and great in noodle dishes. 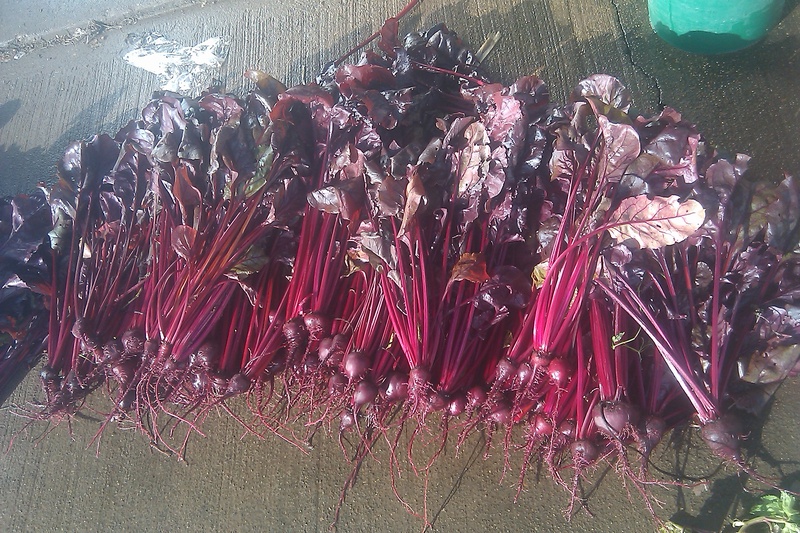 Bull’s Blood Beets with Great Chard Greens: The beets for this week cannot be beat! Beautiful candy-striped interior small tender roots supply the base for gorgeous, burgandy-fuchsia red leaves perfect for braising or even raw in salads. This seed variety is mainly grown for the eye-catching, colorful ‘greens’ that aren’t green at all. Enjoy! A Brassica: This week you still will be getting beautiful broccoli or crunchy cabbage. Radish: Fun bunches of various radish add a nice spicy element to the share this week. We have some round, some long, some fat, some skinny….whatever you get, we hope you’re happy. Brussels Sprouts: We are really excited to bring you these little jewels of the fall fields! In fact it’s the first time we’ve had a successful crop early enough and plentiful enough for every member to enjoy. We had them for dinner last night sauteed in a home-made teriyaki of soy sauce and brown sugar, with caramelized onions and pine nuts. They were great! They are smaller than ones in grocery stores, but more flavorful and tender. Here is a simple recipe for roasted brussels sprouts from the lovely Ina Garten http://www.foodnetwork.com/recipes/ina-garten/roasted-brussels-sprouts-recipe2/index.html. Garlic: More delicious garlic for you to stock up for winter with. Potatoes: Another batch of freshly dug spuds for you to devour or hoard. These pink, and all red potatoes store well and taste lovely. If you keep them in a cool, dark and most importantly dry place they will last for months. Farmer’s Choice: The bonus item this week will be some beautiful eggplant or peppers. Cucumbers are completely gone with the last frost and winter squash we are only going to have enough for one week…..we are saving it for the end. Some better than beautiful looking and tasting food this week to help with the less than beautiful Fall weather…..unless you are into grey and wet. Your meal can be a rainbow, while the weather outside is…….well, grey and wet. Apparently tomorrow the winds will be 2 or 3 mph less, the temperature 2 or 3 degrees more and the rain will subside. That is only for tomorrow and then we get right back to cool, grey and wet. We are at week 23 folks with only one more to go for this 2010 season of happy vegetable harvesting. I’m glad that we will be ending pick-up the week before we fall back for daylight savings. The hours from 4-6 can be dark otherwise. They are getting pretty close already! We are prepping for winter which means planning for spring…I’d love to hear your thoughts and requests for the next growing season…anything new you want to try? A huge THANK-YOU again to all who were a part of the Harvest Gathering this year. It was a great success and fun….here’s a slide-show to enjoy. A special thanks to the wonderful camera work of our dear friends Rob and Shiela! See you all soon and happy eating! 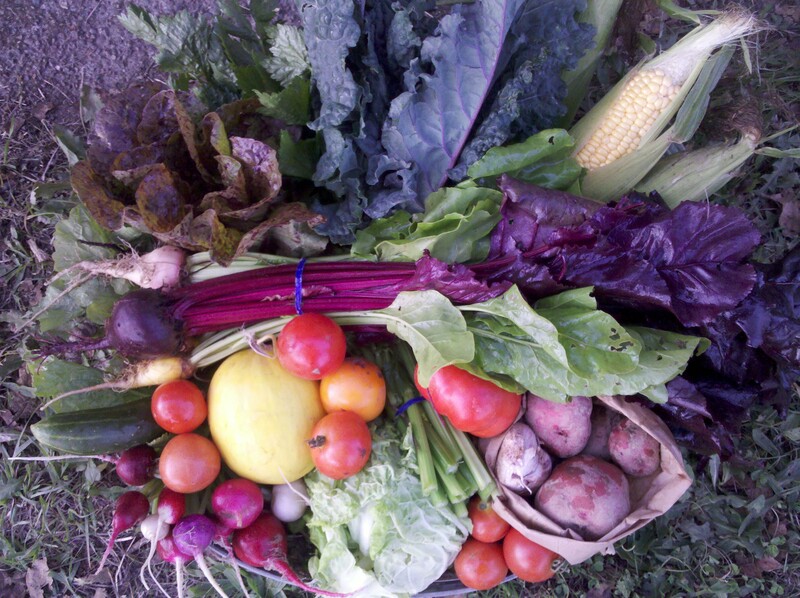 This Weeks Share: Kale, a Brassica (Cabbage or Broccoli), Radish bunch, Celery, Beets or Beans, Tomatoes, Corn, a head of Lettuce, Garlic, Potatoes and a bonus Summer Item of Farmer’s Choice. Big Green: The other than lettuce greens this week are kale. The first frost out here on the farm has already hit and that means kale is getting sweeter and tasting better. Hope you enjoy it. Brassica- Cabbage or Broccoli: You will be getting one or the other. Radish: A nice crispy bunch of spicy, colorful radish make the share this week. Celery: Everyone will get a flavorful bunch of cutting celery this week. The greens of this celery are a very fair substitute for parsley and are great in soup or sauces. We munch on the small stalks raw….yum. Beets or Beans: Some of you will get the remaining snap-string beans this week, while the rest of you will get a nice bunch of beets will beautiful greens. Tomatoes: We still have tomatoes out here on the farm, but we have had some frost and are worried about how the cold will effect production. Some of you may get tomatoes picked a bit green, but just give them some counter time and they should ripen up nicely for you. Corn: This is the very last of our sweet corn. Stick a fork in it….it’s done. Lettuce: This week you all get a small head of lettuce. There are many different types and textures to choose from, but all equally refreshing. Garlic: You all get another nice head of our 2010 garlic. We didn’t get it all planted yesterday! Potatoes: This week we are digging and bagging potatoes for everyone. Hope you enjoy the flavor of these pink and red varieties. Farmer’s Choice: The bonus item for this week will be one of the summer crops we still have out in the field but in lower numbers. Some examples might be cucumber, melon, eggplant or some peppers. We are embarking on week 22 and have only two more after this. We are working hard to ensure you all get everything we have left in the fields to offer this season. This has been one of our best years for growing and yields despite the strange weather. We look forward to repeating it again next season and then some. Hope to see you in the weeks ahead. I’ll send out an email to everyone on our mailing list before and after the holidays reminding folks to keep us on your radar…….spring will be upon us again before we know it. 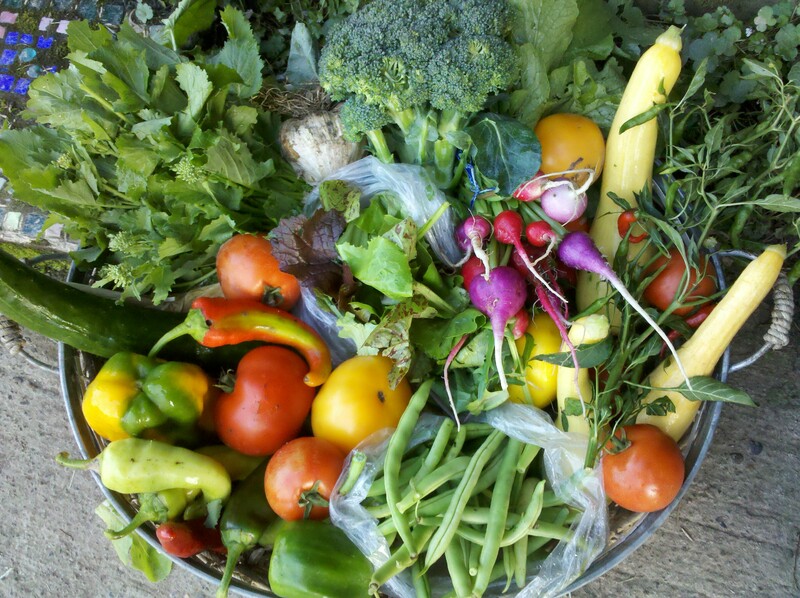 This Weeks Share: Rapini or Radish, a Brassica, Cucumber, Summer Squash, Peppers, Tomatoes, Beans, a bag of mixed Lettuce Greens and Garlic. Rapini or Radish: Well sorry green lovers…no big greens this week! However, some of you will get small greens on tender stems topped with mini broccoli-like heads in the Fall’s first crop of rapini. This is a very quick parboil or steamed vegetable best with butter. We hope you enjoy it. It tastes like a cross between turnips and broccoli. Some others of you will get a bunch of fresh crisp and spicy radish. A Brassica: The brassica for this week will be either broccoli heads or cabbage. Cucumber: The lovely, never bitter, cool crisp cucumbers remain in our fields and your shares. Summer Squash: We are pleased to see that we still have summer squash on the vine for you in absence of the winter squash which we are lacking in this year. There will be some delightful winter squash gems, just not as much as we would have liked. Peppers: Again a pepper medley of some form will be in the share for you. Hope you are enjoying the unique colors, shapes, sizes and flavors. I love the small, funky yellow ones. Tomatoes: Many types of tomatoes remain on the farm. We will continue to harvest them for you until the end. It is truly amazing how the season can turn around and make barren into bounty! Again a hooray for us all. I made a big pot of sauce again this weekend….yummo. Beans: The string beans are still on the vines and bushes so we have them for you this week as well. We had some plantings turn around for us and now we reap the reward. Likely by next week these will be replaced by potatoes. We hope you enjoy our farm fresh golden yellow, green or purple snap/string beans in your share’s. Lettuce Mix: Everyone gets a nice bag of our popular lettuce greens mix this week! It is tasty…lots of baby kale and mustards with some delicious lettuces. It looks like beautiful carpets of shades of green in the field and needs to be shared with all of you. Garlic: Our fresh 2010 garlic makes it back into the share. Hope you have used down your supply and are ready for more! FARM NEWS: Here is week 21 with 3 more to go. We are in the home stretch of our CSA season and for us it’s bittersweet. We will miss seeing all your faces, chatting and sharing at the pick-ups and getting out into the world four days a week. However, I am ready to bunker in and work on projects this winter. My favorites being farm renovation, yarn crafts and soap making and I dream of being productive with them again. There is also always plenty to do out here on the farm, even in the off season. There will be lots of clean up and put away. We have an enormous amount of planning for our CSA 2011 to do, and work on the web-site to finish…..it won’t be dull around here that is for certain. We are looking ahead to make sure that with each week remaining, your share is filled with every possible thing we have to offer. This coming weekend is our annual Fall Harvest Party and we hope to see you out here. I was going to rewrite all the details, but I did that once two weeks ago (see the bottom of this post…https://lovefarmorganics.wordpress.com/2010/09/27/week-19-sept-27-oct-3-csa-newsletter/ ). If you have been curious about your farm or just want to get out of the house this coming beautiful Sunday, come on down! We really would love to have you. Thanks!